The 10th Okinawa Marathon is scheduled to take place on Sunday, February 18 in Okinawa City and its surrounding areas. About four hundred runners have been running in this annual race without absence every year since the first one ten years ago, and there is only one foreign runner among them. Ricky Payne, an American athlete who belongs to the Rising Sun Running Club is the one and only. Those who complete this year’s race are entitled to receive honor with a certification and a T-shirts with their names on listed. 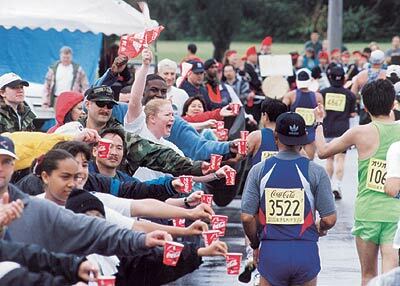 Let’s cheer on all the runners and staff of the big event. The race begins at 9:00 a.m. from the prefectural athletic park in Hiyagon, Okinawa City. Runners will follow the route to Katsuren Castle Ruins, Agena, Enobi, Chibana, Ikento, Kadena AB Gate 2, Kadena Air Base, Gate 5, Chatan, Yamauchi, Rycam, Ishinda, Toguchi and finish back at the athletic park at 3:00 p.m. Along the race course, traffic will be restricted for long hours during the race, so if you are driving please follow the instructions of the police and event staff. Also, please do not park your car along the course or it will be towed.